The surface of Paris resembles that of an iceberg peaking its tip above the surface of the water. Beneath, there lies one of the most extensive and complex underground networks in the world. Alongside almost 300 metro stations and their interlinking tunnels weave a web of sewers, abandoned quarries, catacombs, canals and utility lines. The denser the population has become above ground, the deeper they have burrowed to sustain it. Without this vast infrastructure the city would cease to function, utterly paralyzed. Since moving to Paris I had come close to exhausting every tourist trail and “gem” that the guidebooks had to offer. So one weekend I decided to heed the advice of some locals that I had met, who suggested that I took a look at the other side of Paris. They advised that I take a “troglodyte tour” of their city, to explore the often overlooked underbelly of Paris. But where to start? Almost 150 miles of underground train track knit between at least 185 miles of catacomb tunnels and over 1300 miles of sewers, all right under the center of the city. 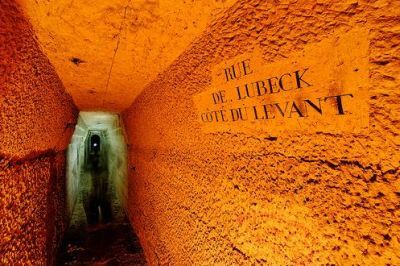 That infernal underground maze, as Gaston Leroux calls it in Phantom of the Opera, stretches down as deep as 112 feet in places, ten stories below the surface. It is the result of 800 years of digging. The buildings, bridges and monuments that now sit on the surface are built from the limestone and gypsum that was excavated from the quarries and tunnels below. I had been putting off visiting the catacombs since arriving in Paris six months previously, so I decided to start there. I had been skeptical of what enjoyment could be taken from visiting one of the largest mass graves on earth. Deep within the bowels of the city are the bones of more than six million Parisians, the result of overcrowded cemeteries at the end of the eighteenth century. Due to the smell and spread of disease, the overflowing cemeteries spilled their less important clientele into the caverns and old limestone quarries underneath Paris, forming what are now known as the catacombs. Spiraling down the 130 steps from the entrance — an unassuming doorway in the 14th arrondissement — I entered a dimly lit gallery that led onto a long tunnel. I made my way through, crunching over wet gravel and ducking my head to avoid scraping it on the dripping ceiling, until I reached two pillars that marked the entry to the ossuary. The words “Arrête, c’est ici l’empire de la Mort” (“Stop, this is the empire of the dead”) were inscribed in the stone above. For the next mile or so, I followed the tunnels as they wound their way under Paris. Every wall is packed to the ceiling and stacked 10 feet deep with skeletons. The anonymous bones of long forgotten people, placed without prejudice. The skulls of servants atop those of their masters, revolutionaries side by side with aristocrats, have been arranged into macabre compositions for the hoards of morbid tourists to photograph, poke at or even pocket. As I resurfaced to the bright sunshine above, my bag was searched by a security guard. Looking behind him I saw two boxes filled with about half a dozen skulls and various fibulas and femurs. When I asked if that those were all of the souvenirs that people had tried to take in the past he said, “No, that is just today”. There are four ghost stations under Paris. They are stations that are still in existence, though no longer functioning having closed down during World War II and never reopening. They remain intact, though the only visitors now are tour groups, vandals and the homeless. The tour takes you to St. Martin, an old station in the 3rd arrondissement. Every wall and ceiling is covered in graffiti, though old pre-war adverts tiled onto the walls remain, offering long-forgotten products. Away from the tour, but still in the metro, I headed to the sewers, through the same train tunnels that the Nazis used to flee Paris at the end of the War. I was told that just across the bridge from the station Alma-Marceau, I could enter the sewers, where peculiarly Paris has its own sewer museum. In fact, the sewers — seen upon their completion as a magnificent feat of engineering — have been a tourist attraction since not long after the modern network was created in 1850. Originally, carts suspended under walkways carried the curious visitor, followed by boats up until 1975. Now it is metal grate walkways that you walk along, allowing you to see all that passes underneath your feet through the murky rivers. Each street, boulevard and alley has its equivalent underground waterway, signposted at each end just as they are on the surface. The sewers were damp, dark and noisy, though I was surprised at how quickly I became accustomed to the smell. It is a fully operating part of the sewer so there is a lot of waste to be seen and I was told to avoid touching the walls. I took the self-guided tour along the 500 yards of walkways, and while other tourists were marveling at the engineering, the machines and tools used to clear the waste, I found myself intrigued by the history. 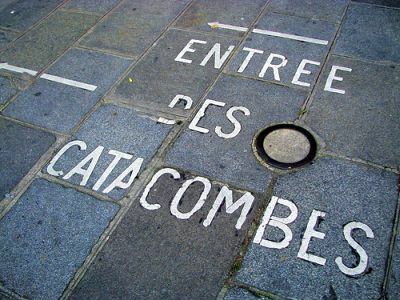 As with the tunnels of the catacombs, the Paris sewers were used by revolutionaries and French resistance and have been the setting for secret meetings, great escapes and novels. Underneath Paris is a place unchanged in centuries, a place where the dead outnumber the living on the surface three-fold. It is a historical imprint that cannot be bulldozed or knocked down, as any change to this labyrinth could result in catastrophic cave-ins and buildings to collapse on the surface. The walls and ceilings of the caverns and tunnels reflect this history, with graffiti and engravings — some centuries old — reflecting the thoughts and actions of the cross-section of those people underground. 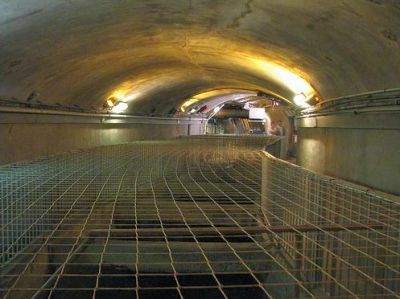 The tunnels tell the stories of everyone from sewer workers and diggers, to revolutionaries and French resistance. And as I snaked my way back home on the metro, I stared out of the window of the carriage into the darkness, imagining what lay just beyond the tunnel walls.